Although Pissarro was primarily a landscape painter, he produced an important group of market scenes portraying peasants in dramatic close-up. Here, a woman selling eggs at the artist’s local poultry market stands with her back to us, on the lookout for her next customer. Painted with the bright colors and palpitating brushwork of Pissarro’s late Impressionist style, the picture is insistently modern and insists on the modernity of the people it represents. Whereas earlier painters had depicted French peasants as figures outside of time, mystically united with the land, Pissarro painted them as his neighbors, working to feed their families as he did to feed his own. [Bernheim Jeune, Paris, ca. October, 1916, sold 14 March 1922 to]. Albert Poullot, Paris, still in 1930. [Jacques Dubourg, Paris, by 1937, still in 1938]. [C. W. Kraushaar Art Galleries, New York, in 1939-still in 1942]. Mlle. Janine Darrigol, Paris, by 1956 until at least 1962. [E. V. Thaw & Co., New York]. Camille Pissarro used a myriad of short brushstrokes to build this densely packed Impressionist scene of the bustling poultry market at Pontoise, the town near Paris where he lived. Three peasants, their backs turned toward us, dominate the composition. In the background, in a haze of color, smaller figures mill about among the poultry stands. Notice the ducks at the bottom left and at the right, a basket, with eggs nestled in hay that glints in the sun. 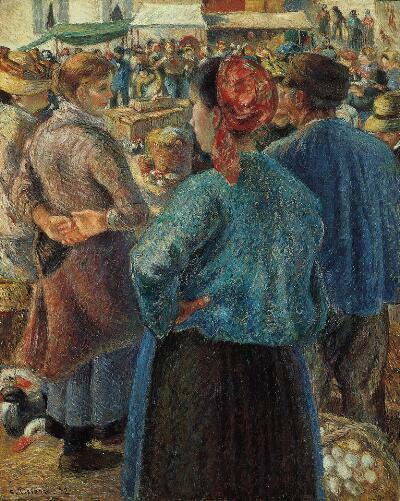 Pissarro pushes us deeply into the picture, allowing us to experience this busy market close-up. We can almost sense the rough fabrics of the farmer’s hand-woven clothing and hear their noisy chatter. Yet, despite our proximity, none of the principal actors acknowledges us in any way. We are at once immersed in and detached from the scene. In the 1880s, Pissarro painted a number of market scenes. The eldest of the Impressionist painters, he helped organize their first exhibition in 1874. Subjects like this one reflect his staunch socialist sympathies. He himself lived on the edge of poverty until he was well over 60. He died in 1903, at the age of 73.